Suda çözünen B grubu vitaminler içerisinde yer alan folat besinler içerisinde doğal olarak bulunmaktadır. Folik asit vitaminin sentetik formudur, besin desteklerinde ve zenginleştirilmiş besinler içerisinde yer almaktadır. Gebe ve fetüs fizyolojisinde önemli bir role sahip olan folat gereksinmesinin gebe kadınlarda tek başına diyet ile karşılanması mümkün değildir. Folat ile başta nöral tüp defekti ve megaloblastik anemi olmak üzere, postpartum depresyon, doğum ağırlığı, çocukluk çağı alerjik hastalıkları, konjenital kalp hastalıkları, otizm vb. sağlık sorunları yakından ilişkilidir. Bu nedenle tüm dünyada nöral tüp defekti, anemi vb. sağlık sorunlarını önlemek amacıyla planlı bir gebelik ile gebelik öncesinde başlayan ve gebelik süresince devam edilen folik asit desteği (400 µg/gün) yaygın olarak önerilmektedir. Folate belongs to B group of vitamins. It exists naturally in foods and it is a water soluble vitamin. Folic acid is a synthetic form of folate and it exists in food supplements and fortified foods. Folate has an important role in pregnant women and fetus physiology. Only diet is not enough to supply required amount of folate. There is an important relationship between folate and neural tube defects, megaloblastic anemia, postpartum depression, birth weight, childhood allergic disorders, congenital heart disorders, autism etc. So with a planned pregnancy folic acid supplementation (400 µg/day) beginning before pregnancy and continued during pregnancy is recommended to prevent neural tube defects, anemia and other health problems. Altaş, M., Aras, M., Altaş, Z. G., Aras, Z., Serarslan, Y., Yılmaz, N. (2012). Nöral tüp defektli hastalara retrospektif bakış. Mustafa Kemal Üniversitesi Tıp Fakültesi Dergisi, 3(9), 22-28. Anderson, G., Maes, M. (2013). Postpartum depression: psychoneuroimmunological underpinnings and treatment. Neuropsychiatric Disease and Treatment, 9, 277-287. Bailey, B.L., Hausman, B.D. (2017). Folate status in women of reproductive age as basis of neural tube defect risk assessment. Annals of The New York Academy of Sciences, 1414(1), 82/95. Baohong, M., Jie, Q., Nan, Z., Yawen, S., Wei, D., Xiaochun, H., Hongmei, C., Xiaochun, H., Hongmei, C., Xiaojuan, L., Ling, L., Zhangfeng, T., Sijuan, X., Huang, H., Min, Z., Xiaoying, X., Weitao, Q., Quing, L., Zhang, Y. (2017). Maternal folic acid supplementation anddietary folate intake and congenital heart defects. Plos One, 12(11), 1-14. Castellanos-Sinco, H.B., Ramos-Peἠafiel, C.O, Santoyo-Sἀnchez, A., Collazo-Jaloma, J., Martỉnez-Murillo, C., Montaἠo-Figueroa, E. Sinco-Angelas, A. (2015). Megaloblastic anaemia: folic acid and B12 metabolism. Revista Medica Del Hospital General De Mexico, 78(3), 135-143. Chandra, J. (2010). Megaloblastic anemia: back in focus. Indian Journal of Pediatrics, 77(7), 795-799. Chong, M.F, Wong, J.F., Colega, M., Chen, L.W., van Dam, RM., Tan, CS. Lim, A.L., Cai, S., Broekman, B.F., Lee, Y.S., Saw, S.M., Kwek, K., Godfrey, K.M., Chong, Y.S., Gluckman, P., Meaney, M.J., Chen, H. (2014). Relationships of maternal folate and vitamin B12 status during pregnancy with perinatal depression: The GUSTO study. Journal of Psychiartic Research, 55, 110-116. Crider, S.K., Devine, O., Hao, L., Dowling, N.F., Li, S., Molloy, A.M. Li, Z., Zhu, J., Berry, R.J. (2014). Population red blood cell folate concentrations forprevention of neural tube defects: bayesian model. The BioMed Journal, 349, 1-12. Czeizel, A.E., Dudἀs, I., Vereczkey, A., Bἀnhidy, F. (2013). Folate deficiency and folic acid supplementation: the prevention of neural tube defects and congenital heart defects. Nutrients, 5(11), 4760-4775. Czeizel, A.E., Vereczkey, A., Szabỏ, I. (2015). Folic acid in pregnant women associated with reduced prevalence of severe congenital heart defects in their children: a national population-based case–control study. Europen Journal of Obstetrics & Gynecology and Reproductive Biology, 193(2015), 34-39.
da Silva Lopes, K., Ota, E., Shakya, P., Dagvadorj, A., Balogun, O.O., Peňa-Rosas, J. De-Regil, L.M., Mori, R. (2017). Effects of nutrition interventions during pregnancy on low birth weight: an overview of systematic reviews. BMC Global Health Research and Policy, 2(3), 1-12. Dietitians of Canada (2016). Food sources of folate. Retrieved from https://www.dietitians.ca/Your-Health/Nutrition-A-Z/Vitamins/Food-Sources-of-Folate.aspx (Erişim tarihi: 21.12.2017). Dunstan, J.A., West, C., McCarthy, S., Metcalfe, J., Meldrum, S., Oddy, W.H., Tulic, M.K. (2012). The relationship between maternal folate status in pregnancy, cord blood folate levels, and allergic outcomes in early childhood. European Journal of Allergy and Clinical Immunology, 67(2012), 50-57. Ebera, S. (2017). Nutritional role of folate. Congenital Anomalies, 57(5), 138-141. EFSA NDA Panel (EFSA Panel on Dietetic Products, Nutrition and Allergies). (2014). Scientific Opinion on Dietary Reference Values for Folate. EFSA Journal, 12(11), 1-59. Fekete, K., Berti, C., Trovato, M., Lohner, S., Dullemeijer, C., Souverein, O.W. Cetin, I., Decsi, T. (2012). Effect of folate intake on health outcomes in pregnancy: a systematic review and meta-analysis on birth weight, placental weight and length of gestation. Nutrition Journal, 11(75), 1-8. Fischer, M., Stronati, M., Lanari, M. (2017). Mediterranean diet, folic acid and neural tube defects. Journal of Pediatrics, 43(74), 1-8. Frye, E.R. (2014). Metabolic and mitochondrial disorders associated with epilepsy in children with autism spectrum disorder. Epilepsy & Behavior, 47(2015), 147-157. Greenberg, J.A., Bell, S.J., Guan, Y., Yu, Y.H. (2011). Folic acid supplementation and pregnancy: more than just neural tube defect prevention. Reviews in Obstetrics and Gynecology, 4(2), 52-59. Greene, N.D.E., Copp, A.J. (2014). Neural tube defects. Annu Rev Neurosci, 37(2014): 221-242. Gropper, S., Smith, J. (2013). Vitamins. Peggy Williams & Elesha Weldman (Ed. ), Advanced nutrition and human metabolism (s. 344). United States of America: Cengage Learning. ISBN 978-1-133-04877-0. Hamishehkar, H., Ranjdoost, F., Asgharian, P., Mahmoodpoor, A., Sanaei, S. (2016). Vitamins, are they safe?. Advanced Pharmaceutical Bulletin, 6(4), 467-477. Hoffbrand, A.V., Weir D.G. (2001). The history of Haematology. British Journal of Haematology, 113(3), 579-589. Huhta, J.C., Linask, K. (2015). When should we prescribe high-dose folic acid to prevent congenital heart defects? Current Opinion in Cardiology, 30(1), 125-131. Ja Hyeong, K., Kyoung-Sook, J., Eun-Hee, H., Hyesook, P., Mina, H., Yun-Chul, H. Soo-Young, B., Soo-Jeong, L., Kyung-Yeon, L., Seon-Ho, L., Yangho, K., Min-Ho, K., Namsoo, C. (2014). Relationship between prenatal and postnatal exposures to folate and risks of allergic and respiratory diseases in early childhood. Pediatric Pulmonology, 50(2), 155-163. Leirgul, E., Gildestad, T., Nilsen, R.M., Fomina, T., Brodwall, K., Greve, G. Vollset, S.E., Holmstrom, H., Tell, G.S., Qyen, N. (2015). Periconceptional folic acid supplementation and infant risk of congenital heart defects in Norway 1999-2009. Paediatrik Epidemiology, 29(5), 391-400. Li, X., Li, S., Mu, D., Liu, Z., Li, Y., Chen, X. You, F., Li, N., Deng, K., Deng, Y., Wang, Y., Zhu, J. (2013). The association between periconceptional folic acid supplementation and congenital heart defects: A case–control study in China. Preventive Medicine, 56(6), 385-389. Liu, J., Li, Z., Greene, N.D.E., Li, H., Ren, A. (2017). The recurrence risk of neural tube defects (NTDs) in population with high prevalence of NTDs in northern China. Oncotarget, 8(42), 72577-72583. Lyall, K., Schmidt, R.J., Hertz-Piccioto, I. (2014). Maternal lifestyle and environmental risk factors for autism spectrum disorders. International Journal of Epidemiology, 43(2), 443-464. McStay, C.L., Prescott, S.L., Bower, C., Palmer, D.J. (2017). Maternal folic acid supplementation during pregnancy and childhood allergic disease outcomes: A question of timing? Nutrients, 9(2), 1-14. Morrens, A., Verhaege, J., Vanhole, C., Devlieger, R., Mathieu, C., Benhalima, K. (2016). Risk factors for large-for-gestational ageinfants in pregnant women with type1 diabetes. BMC Pregnancy and Childbirth, 16(1), 1-8. Moussa, N.H., Hosseini, N.S., Haidar, Z.A., Blackwell, S.C., Sibai, B.M. (2016). Folic acid supplementation: what is new? Fetal, obstetric, long-term benefits and risks. Future Science OA, 2(2), 1-12. Nauman, N., Jalali, S., Shami, S., Rafiq, S., Groβe, G., Hilger, A.C. Zhang, R., Mansoor, S., Ludwig, M., Reutter, H. (2018). Low maternal folate concentrations and maternal MTHFR C677T polymorphism are associated with an increased risk for neural tube defects in offspring: a case-control study among Pakistani case and control mothers. Asia Pacific Journal of Clinical Nutrition, 27(1), 253-260. Raghavan, R., Riley, A.W., Volk, H., Caruso, D., Hironaka, L., Sices, L. Hong, X., Wang, G., Ji, Y., Brucato, M., Wahl, A., Stivers, T., Pearson, C., Zuckerman, B., Stuart, E.A., Landa, R., Fallin, M.D., Wang, X. (2017). Maternal multivitamin intake, plasma folate and vitamin B12 levels and autism spectrum disorder risk in offspring. Paediatric and Perinatal Epidemiology, 32(1), 100-111. Roy, A., Kocak, M., Hartman, T.J., Vereen, S., Adgent, M., Piyathilake, C., Tylavsky, F.A., Carroll, K.M. (2017). Association of prenatal folate status with early childhood wheeze and atopic dermatitis. Journal of Clinical & Diagnostic Research, 29(2), 144-150. Saini, K. R., Nile, S.H., Keum, Y.S. (2016). Folates: Chemistry, analysis, occurrence, biofortification and bioavailability. Food Research International, 89(1), 1-13. Salcedo-Bellido, I., Martỉnez-Galiano, J.M., Olmedo-Reguena, R., Mozas-Moreno, J., Bueno-Cavanillas, A., Jimenez-Moleon, J.J., Delgado-Rodriguez, M. (2017). Association between vitamin intake during pregnancy and risk of small for gestational age. Nutrients, 9(12), 1-12. Schmidt, J.R., Hansen, R.L., Hartiala, J., Allayee, H., Schmidt, L.C., Tancredi, D.J., Tassone, F., Hertz-Picciotto, I. (2011). Prenatal vitamins, one-carbon metabolism gene variants, and risk for autism. Epidemiology, 22(4), 476-485. Schmidt, J.R., Tancredi, D.J., Ozonoff, S., Hansen, R.L., Hartiala, J., Allayee, H., Schmidt, L.C., Tassone, F., Hertz-Picciotto, I. (2012). Maternal periconceptional folic acid intake and risk of autism spectrum disorders and developmental delay in the CHARGE (CHildhood Autism Risks from Genetics and Environment) case-control study. The American Journal of Clinical Nutrition, 96(1), 80-89. Steegers-Theunissen, R.P., Twight, J., Pestinger, V., Sinclair, K.D. (2013). The periconceptional period, reproduction and long-term health of offspring: the importance of one-carbon metabolism. Human Reproduction Update. 19(6), 640-655. Surẻn, P., Roth, S., Bresnahan, M., Haugen, M., Hornig, M., Hirtz, D., Lie, K.K., Lipkin, W.I., Magnus, P., Reichborn-Kjennerud, T., Schiolberg, S., Davey, S.G., Qyen, A.S., Susser, E., Stoltberg, C. (2013). Association between maternal use of folic acid supplements and risk of autism in children. The Journal of the American Medical Association, 309(6), 570-577. Tezel, A. (2006). Pospartum Depresyonun Değerlendirilmesinde Hemşirelerin/Ebelerin Sorumlulukları. New Symposium Journal, 44(1), 49-52. The society of obstetricians and gynaecologists of Canada (2007). Pre-conceptional vitamin/folic acid supplementation 2007: the use of folic acid in combination with a multivitamin supplement for the prevention of neural tube defects and other congenital anomalies. Journal of Obstetrics and Gynaecology Canada, 29(12), 1003-1013. Türkiye Cumhuriyeti Sağlık Bakanlığı (2016). Türkiye Beslenme Rehberi 2015. s. 172. Retrieved from https://dosyasb.saglik.gov.tr/Eklenti/10915,tuber-turkiye-beslenme-rehberipdf.pdf (Erişim tarihi: 21.12.2017). Uzdil, Z. ve Özenoğlu, A. (2015). Gebelikte çeşitli besin öğeleri tüketiminin bebek sağlığı üzerine etkileri. Balıkesir Sağlık Bilimleri Dergisi, 4(2), 117-121. Verhagen, H., Andersen, R., Antoine, J.M., Finglas, P., Hoekstra, J., Kardinaal, A., Nordmann, H., Pekcan, G., Pentieva, K., Sanders, T.A., van den Berg, H., van Kranen, H., Chiodini, A. (2012). 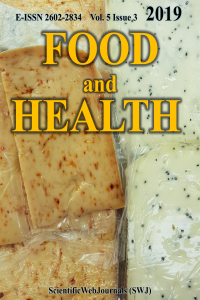 Application of the BRAFO tiered approach for benefit–risk assessment to case studies on dietary interventions. Food and Chemical Toxicology. 50(4), 710-723. Wang, H., De Steur, H., Chen, G., Zhang, X., Pei, L., Gellynck, X., Zheng, X. (2016). Effectiveness of folic acid fortified flour for prevention of neurol tube defects in high risk region. Nutrients, 8(3), 1-11. Wang, H., Ge, X., Zhu, B., Xuan, Y., Huang, K., Rutayisire, E. Mao, L., Huang, S., Yan, S., Tao, F. (2016). Maternal continuing folic acid supplementation after the first trimester of pregnancy ıncreased the risk of large-for-gestational-age birth: a population-based birth cohort study. Nutrients, 8(8), 1-11. Wang, T., Zhang, H.P., Zhang, X., Liang, Z.A., Ji, Y.L., Wang, G. (2015). Is folate status a risk factor for asthma or other allergic diseases? The Korean Academy of Asthma, Allergy and Clinical Immunology, 7(6), 538-546. Wickramasinghe, N.S. (2006). Diagnosis of megaloblastic anaemias. Blood Reciews, 20(6), 299-318. Wiens, D., DeSoto, M.C. (2017). Is high folic acid intake a risk factor for autism? Brain Sciences, 7(149), 1-10. World Health Organization (2012a).Guideline: Daily iron and folic acid supplementation in pregnant women. World Health Organisation, 1-27. World Health Organization (2012b). Guideline: Intermittent iron and folic acid supplementation in non-anemic pregnant women. World Health Organization, 1-31. World Health Organization (2015). Guideline: Optimal serum and red blood cell folate concentrations in women of reproductive age for prevention of neural tube defects. World Health Organisation, 1-38. World Health Organization, United Nations International Children's Emergency Fund and Micronutrient Intiative (2015). Multiple micronutrient supplements in pregnancy: implementation considerations for successful integration into existing programmes 18 - 20 August‎ 2015, Geneva, Switzerland. World Helath Organization (2009). Recommendations on wheat and maize flour fortification meeting report: ınterim consensus satement. World Health Organization, 1-3. Yan, J., Liu, Y., Cao, L., Zheng, Y., Li, W., Huang, G. (2017). Association between duration of folic acid supplementation during pregnancy and risk of postpartum depression. Nutrients, 9(11), 1-11. Yan, J., Zheng, Y.Z., Cao, L.J., Liu, Y.Y., Li, W., Huang, G.W. (2017). Periconceptional folic acid supplementation in Chinese women: a cross-sectional study. Biomedical and Environmental Sciences, 30(10), 737-748. Zimmerman, S. (2011). Fifteen years of fortifying with folic acid: birth defects are reduced and healthcare expenses are averted. Sight and Life, 25(2011), 54-59.